Flying to Paro – The ultimate mountain flight! Flight to Paro airport in Bhutan is world famous for two main reasons. The first is the unusual landing procedure during which plane maneuvers dramatically in the narrow valley before making it to the runway. 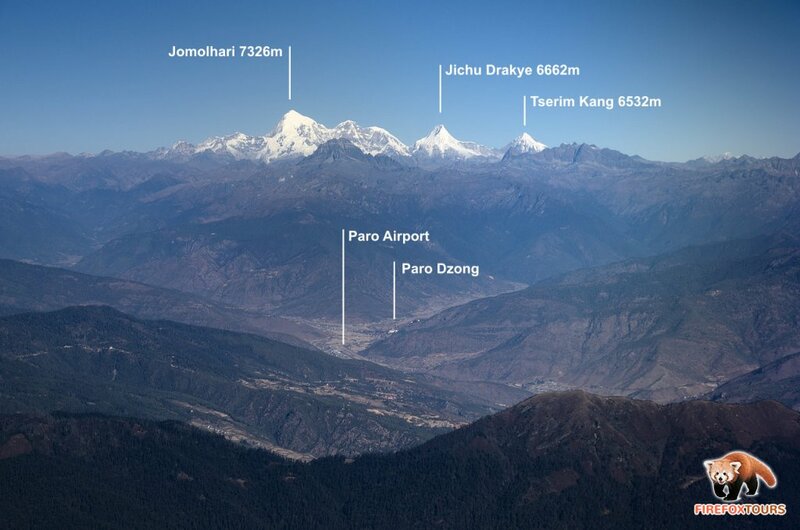 Paro is rightfully considered as one of the most daring international airports in the world. 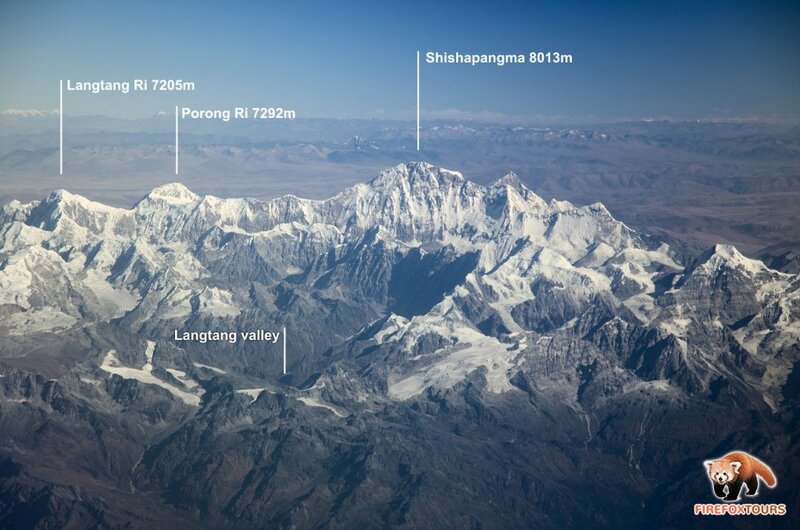 Second and much more interesting feature of the flight is the stunning mountain panorama which you can see when flying from Delhi and Kathmandu in good weather conditions. In this article we will tell you what you can see and how to enjoy the experience to the maximum! Not every flight to Paro is blessed with the stunning mountain panoramas. Basically only if you fly from Delhi or from Kathmandu, you can see the Mt. Everest and other big snowy peaks. When flying from Bangkok you might briefly spot Kangchenjunga provided you have pitstop in Bagdogra. 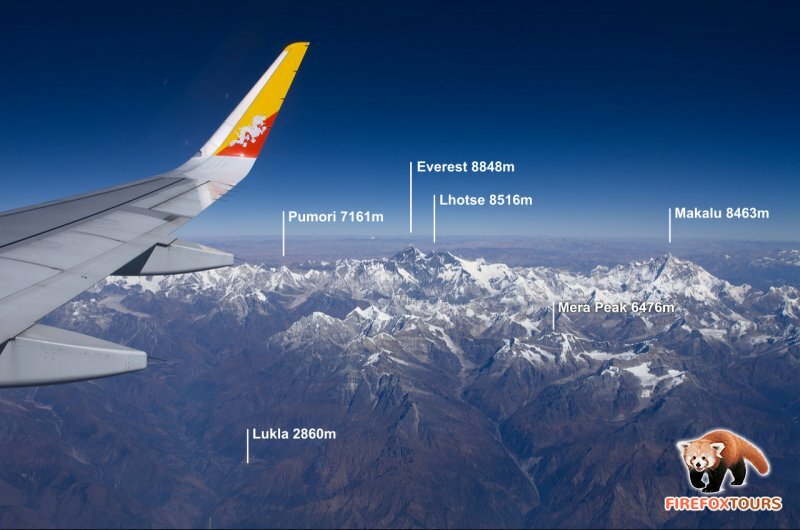 All Paro bound flights might have chance to glimpse Jomolhari and some other mountains on the Bhutan-Tibet border before landing. Anyway as far as this article is concerned, we will only discus the flights from Delhi and Kathmandu to Paro and vice versa. After take off from Delhi, you might spot the belt of snowy mountains to the north, but it will be still too far. You will get closer to the Himalayas only after about 1 hour 10 minutes flight while reaching above Kathmandu. You might have pitstop there or not. 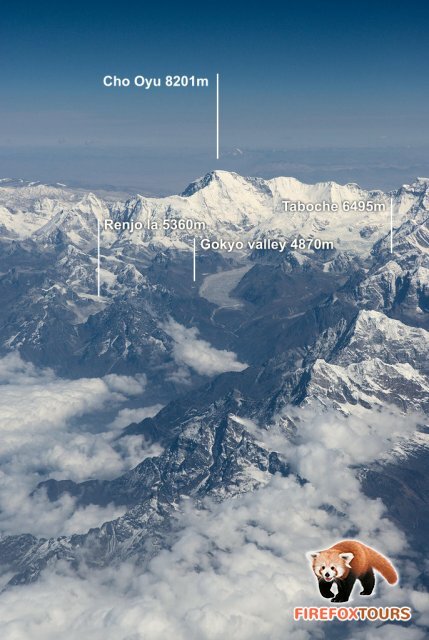 In any case the real fun starts after about 1 hour 20 minutes flight form Delhi or 15 to 20 minutes flight from Kathmandu with 5 out of the total 14 eight-thousanders being clearly visible. 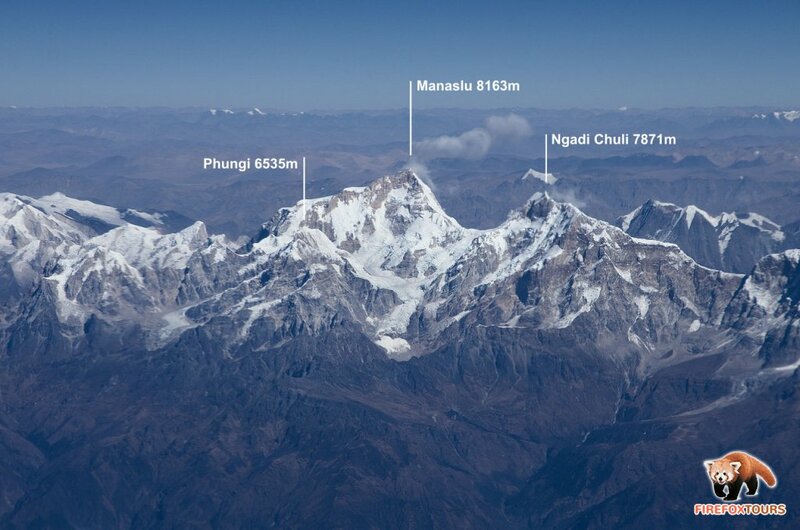 In order of appearance Cho Oyu, Everest, Lhotse, Makalu and Kangchenjunga. 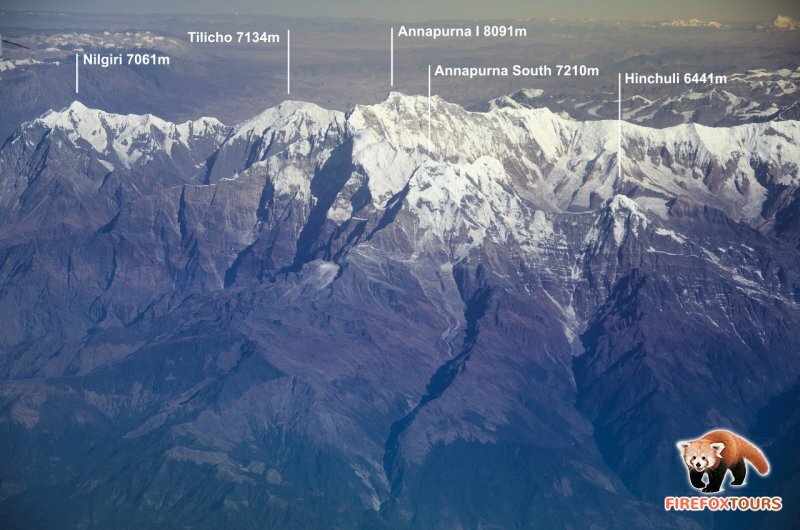 Another 4 eight-thousanders, Dhaulagiri, Annapurna, Manaslu and Shishapanga, might be spotted from distance and innumerable lower peaks as well. 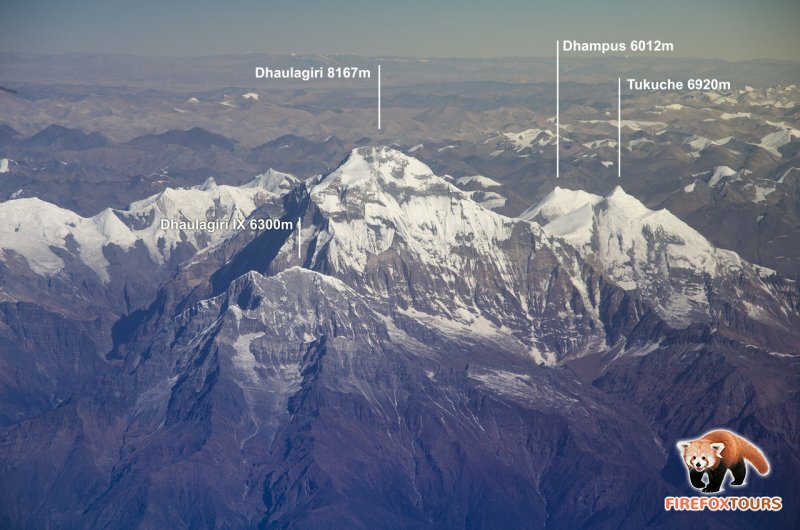 When flying back form Paro to Delhi, you might be lucky to be routed through northern flight corridor after crossing Kathmandu, enabling you to see Shishapangma, Manaslu, Annapurna and Dhaulagiri form close distance. 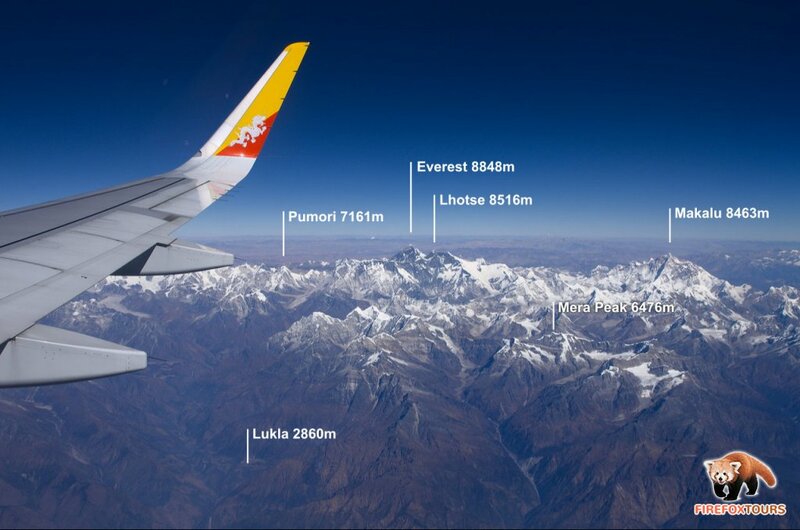 You might even spot holy peaks of Kailas and Gurla Mandata in Tibet when flying over western Nepal. The season and time of the day affects your chances to see the peaks. If you’re coming in the late autumn, winter or early spring, the clear weather is more likely. Early morning is also generally better as the air humidity and clouds do buildup in the course of the day. It doesn’t really matter if you fly with Airbus (jet) or ATR (turpoprop) plane. Both aircraft offers very nice and close views, only difference being in the cruise altitude and speed, which is both higher with jets. Even if you are lucky with the weather, you still need to get the window seat on the mountain facing side of the plane. Which side is that? When flying from Delhi or Kathmandu to Paro, you should sit on the left side while facing the direction of the flight. 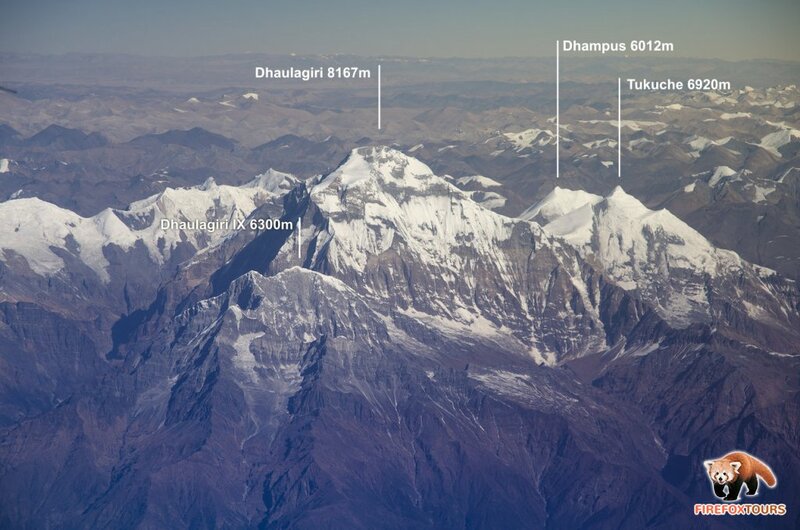 When flying from Paro to Delhi or Kathmandu, the mountains are visible to the right. There are two airlines operating this line, state controlled Drukair and private Bhutan Airlines. Only Drukair did offer on-line check-in facility in the time writing. If you want to get seats, you should definitely check-in yourself in the earliest time possible. On-line checking is open 24 to 4 hours before the flight. If you fly with Bhutan Airlines or Drukair's on-line checking doesn't work for some reason, your only option is to come to the airport well ahead of the flight and request the airline’s ground staff to give you desired seats while checking-in. We usually recommend to come at least 3 hours before the flight departure. It might seem early but reckon that the other passengers want to see the mountains too, and if you come late, they won’t. Which one is the Everest? 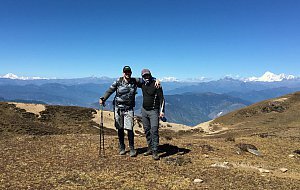 Apparently there is much more to be seen, including Everest’s neighboring eight-thousander Lhotse and many other spots you might know form the Everest Base Camp trek. But this is really not all of it! 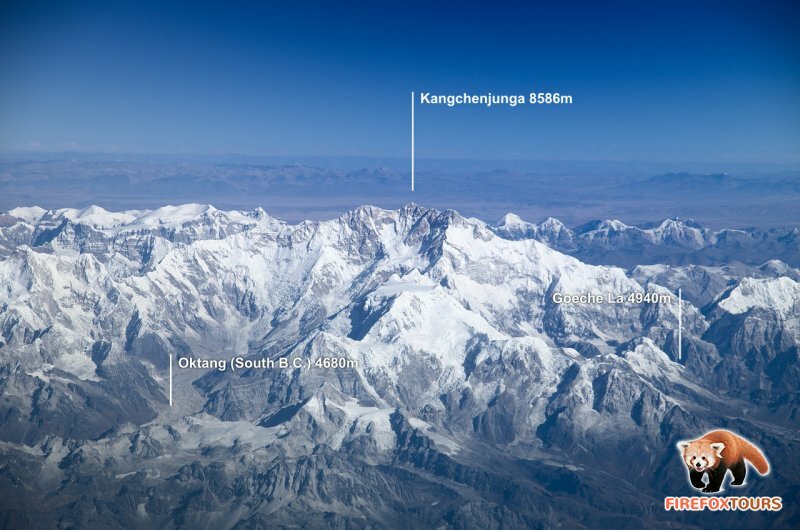 Just few minutes before reaching to the Everest, you could have spotted Cho Oyu, the 6th highest mountain in the world and allegedly easiest eight-thousander. 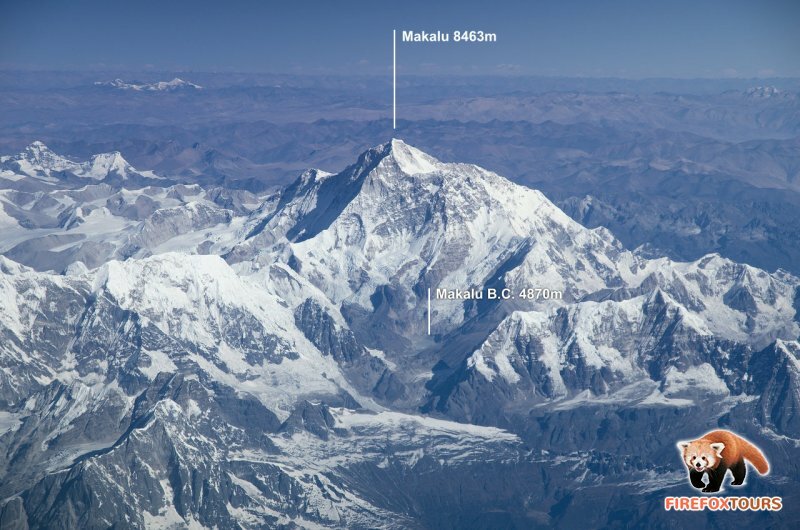 Right after passing the Everest, there is another major mountain, solitary Makalu peak. Many people actually do confuse it with the highest mountain on Earth, so be vigilant! Now you have some ten minutes to relax and review your photos. 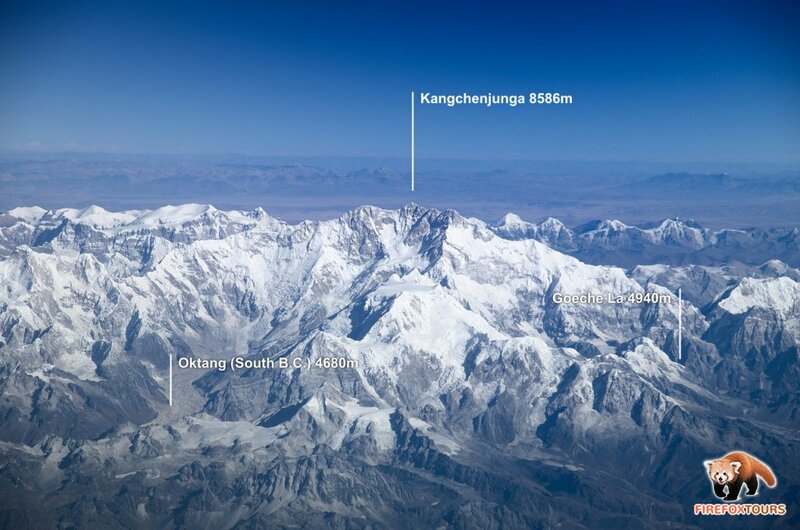 The next mountain which will come at sight, marks border of India and Nepal, the Kangchenjunga. The plane will usually start descending by now. Cruising over the Darjeeling and Sikkim, you will get to maneuvering over the Western Bhutan, getting to see holy Jomolhari mountain on the Bhutan-Tibet border. Soon after, you will descend to Paro airport and land! Same mountains can be seen when flying opposite direction. Anyway when crossing Kathmandu, you might be routed through northern corridor to Delhi which will permit you some more great views! 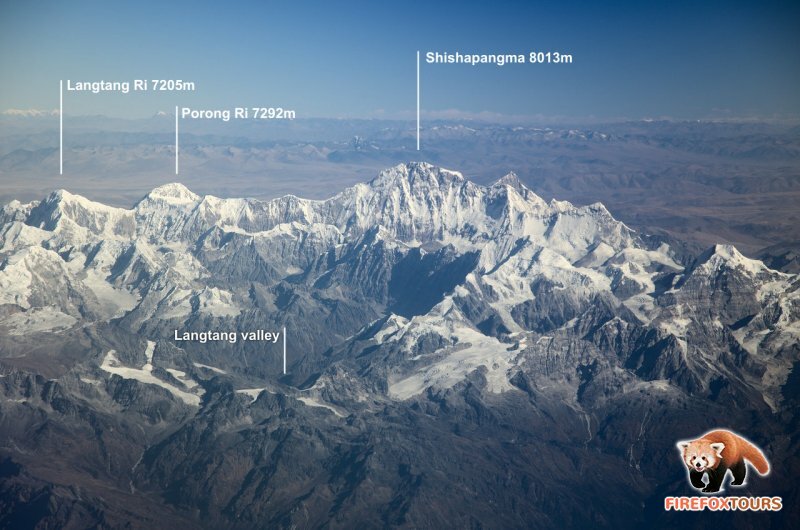 For example while flying above Kathmandu valley, you might spot Shishapangma, the lowest eight-thosander, which is completely located on Tibetan soil. Manaslu, the eight highest mountain in the world will follow after about 5-10 minutes. 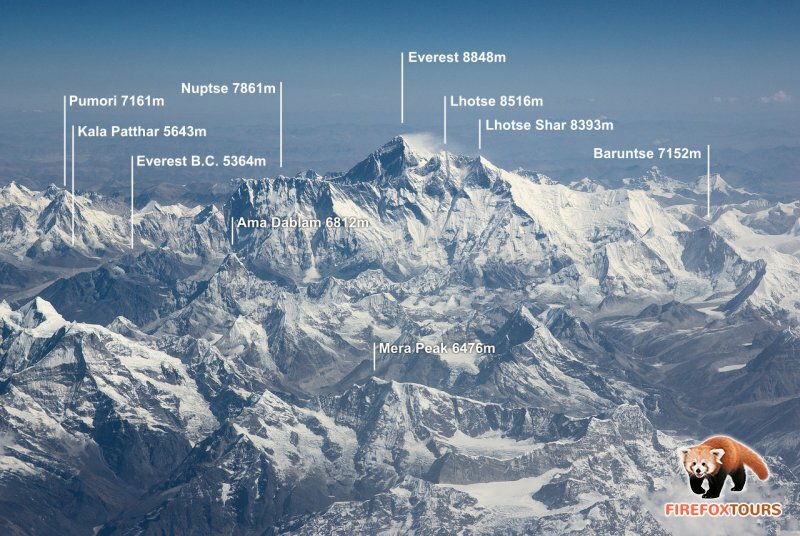 Very soon after, the large range of Annapurnas will emerge, finishing with the highest one. 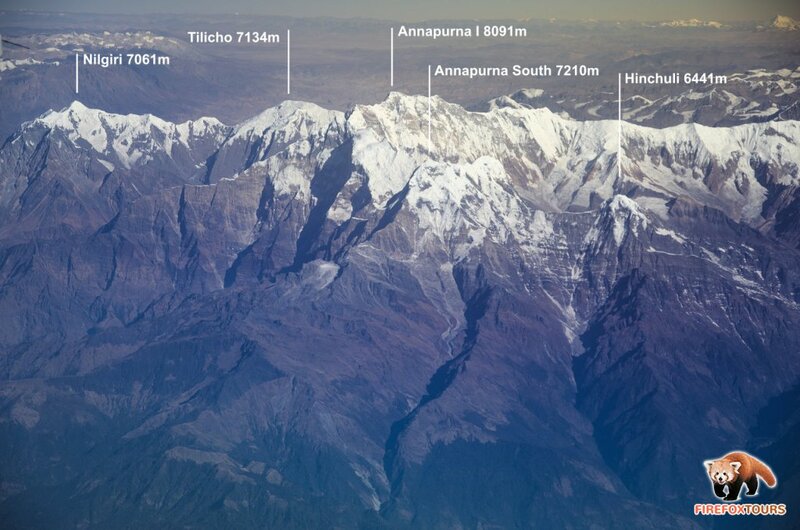 People familiar with Annapurna Circuit and Annapurna B.C. Trek might spot lot of known places and other peaks. And again, right after crossing Kali Gandaki valley, the last eight-thousander, the Dhaulaigi comes to the stage. 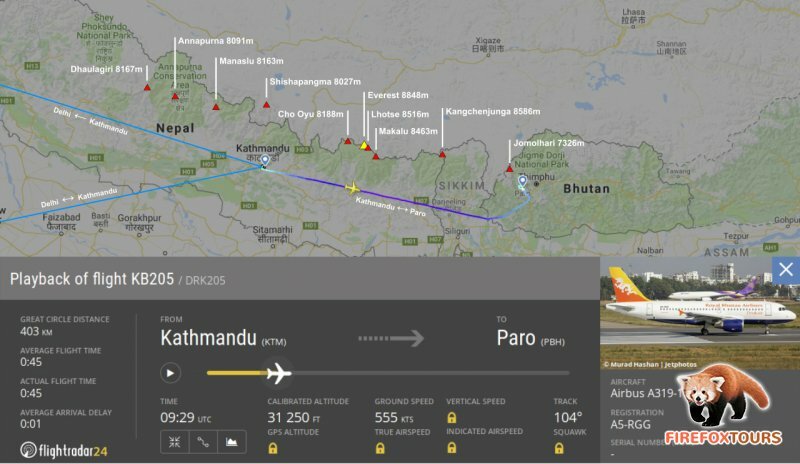 Is Paro flight better than commercial mountain flights? 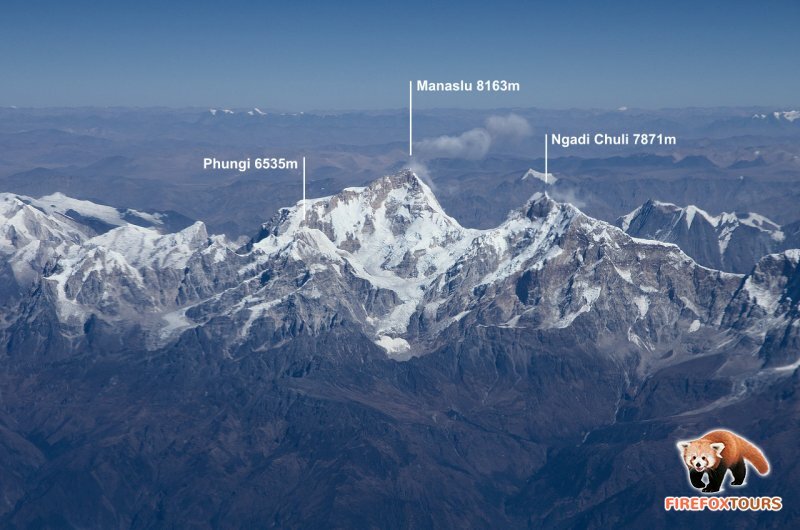 For about 200 USD you can make a quite nice mountain flight from Kathmandu to Everest and back. 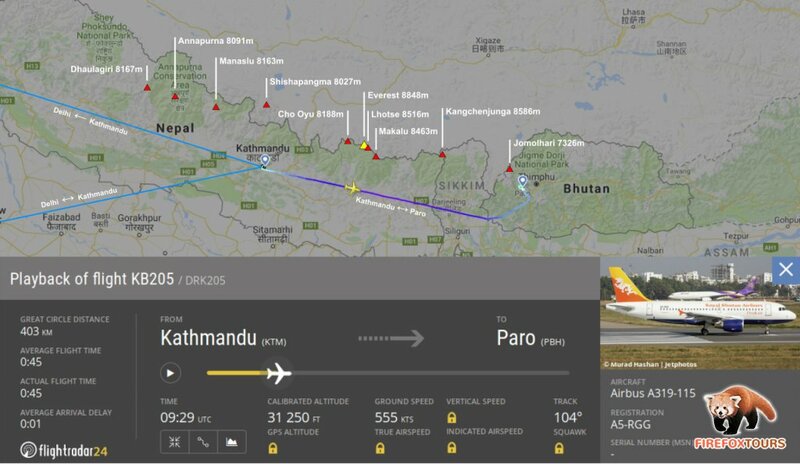 How it compares to Paro flight? 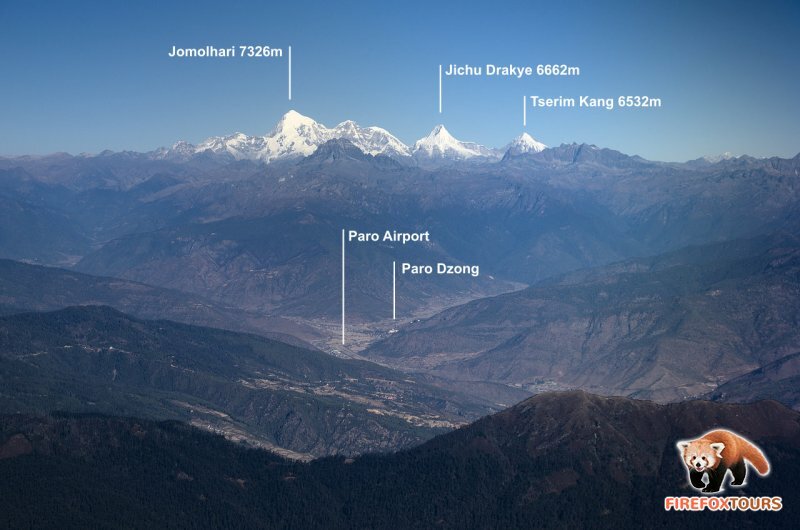 In perfect weather conditions and provided you get good seats, the flight to Paro is comparable if not superior to these commercial mountain flights. Anyway seating can’t be guaranteed and sometimes the flight time is in the afternoon, with all mountains clouded, so you still might be tempted to pay extra for dedicated experience. Also these mountain flight tends to get closer to the mountains and do fly in somewhat lower altitude, giving you more intimate feeling of being side by side with the mountains rather than above them. In any case if you fly to Paro, do make yourself ready for extraordinary experience. Timely check-in is definitely worth of it and weather is the matter of luck. Have a tons of it! We can honestly say, that the tour from the beginning till the end was success – all including weather, guide and drivers. Bhutan exceeded our expectation in everything. Kind people, gorgeous mountains, beautiful monuments, delicious food and astounding peace.